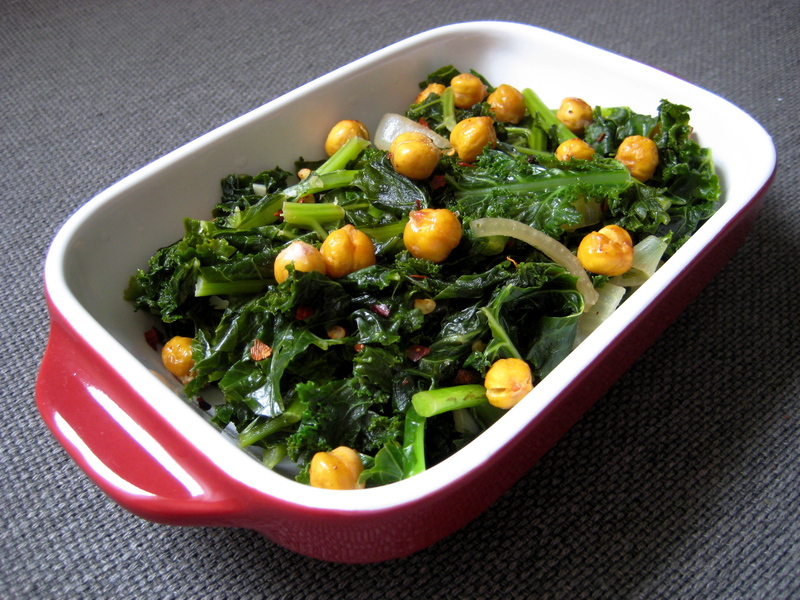 This kale recipe (sans chickpeas) is one of my favourite ways to prepare the green, especially with the cider vinegar and red pepper flakes… the perfect zing and spice to amp up the kale. Adding the chickpeas gives a bit of a crunch, and I frequently change up the spice combination on the chickpeas to bring in a new flavor. To roast the chickpeas, preheat the oven to 425F. Toss with olive oil. Sprinkle with garlic powder, salt, and pepper. Bake for 25 to 40 minutes, depending on how crunchy you want them, stirring often. To make the kale, heat the olive oil in a large skillet over medium heat. Add the onion and cook until translucent, about 5 minutes. Add the garlic and red pepper flakes, cooking until fragrant, about 1 minute. Add the kale. Mix well. Add the water and apple cider vinegar. Increase the heat to medium-high, cooking until the water is evaporated and the kale is soft. Season with salt and pepper. Transfer to a serving dish and toss with chickpeas.